The Baum UltraFold XLT air feed tabletop folder combines all the rugged reliability you would expect from a piece of equipment with the ease of operation of a twist knob. 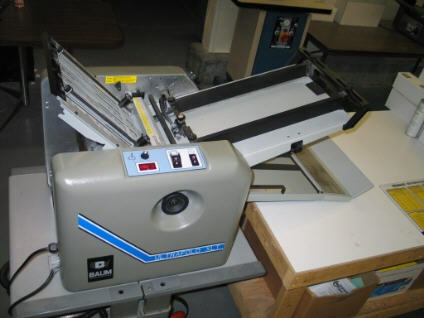 It can easily handle coated stocks as well as high-speed copier and laser-printed stocks--up to 12" x 18". Its easy setup and variable feed speeds ensure an accurate execution of any job. It can perform single, double, and z-folds with great ease, and with right angle unit attached can even do newsletter folds in a single pass.